Various novels and movies over the years have set the stage for the centuries-long battle between humans and werewolves and now here we have an online slot machine to continue the narrative; it’s called Wolf Hunters, it’s developed by Yggdrasil Gaming and it comes with a clever bonus mechanism. Wolf Hunters is a five reel slot with three rows and twenty fixed paylines; there’s a gloomy gothic atmosphere to this game which starts with the spooky darkened reels and continues with the full moon rising behind the buildings in the background. 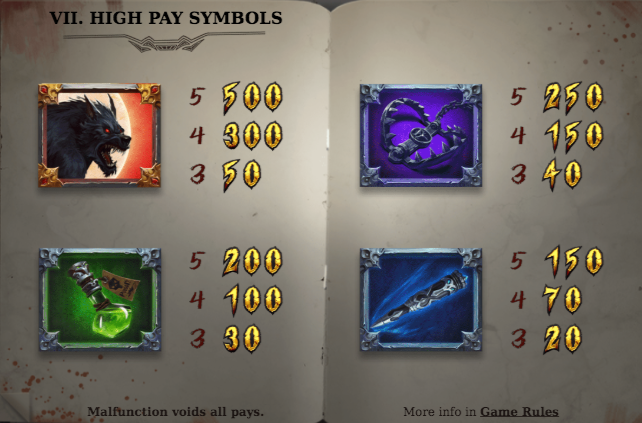 The higher value symbols include the wolf, the green vial, the mantrap and the silver dagger; playing card symbols in red, purple, green and blue represent the lower values. The wild is a big ‘Wild’ which will replace all others to help form winning combos except for the wolf and both hunter bonus symbols. This is triggered each time a wild symbol lands and you’ll receive one free respin with that wild locked in place – any additional wilds will award an extra spin. Every time a werewolf symbol lands it will be attacked by one of the two hunters; if the hunter wins the fight his/her rage meter (to the sides of the reels) will increase by 1 and the wolves health (above the reels) will decrease by 1. These meters are important for reasons we shall explain shortly. Landing two hunter bonus symbols on reels one and five awards ten free spins with a possible retrigger. Collecting 100 rage points for either hunter awards ten free spins with that hunter enraged and more successful if it fights the werewolf. Decreasing the wolves health to zero awards ten free spins with all werewolves acting as wilds and expanding when they land. Collecting three of either hunter during any free spins mode awards two extra spins; any wilds landing after that will expand one place to the left for the male hunter or one to the right for the female hunter. 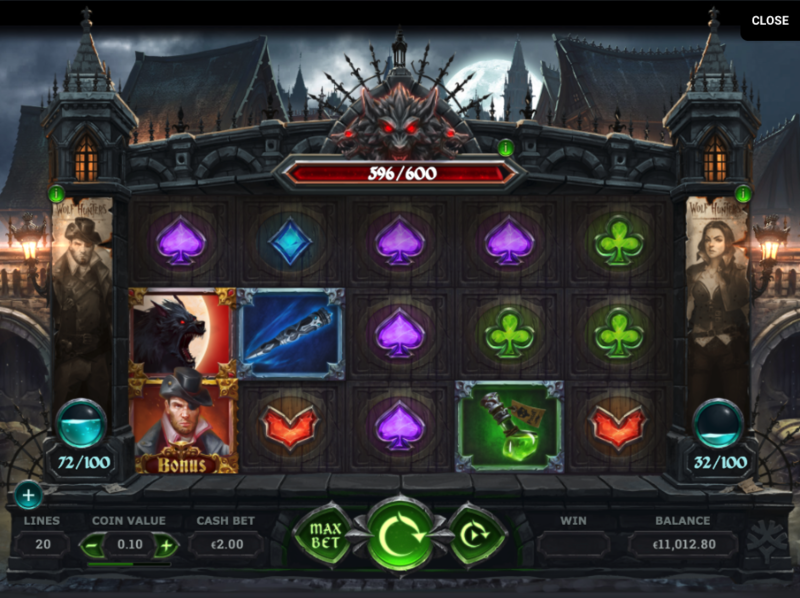 Wolf Hunter is quite an in-depth slots experience but it’s also very playable when you’ve got the rules sussed out; the sound and the graphics create a great gothic atmosphere and there’s always plenty of action on the reels. This game comes with an RTP of 96.30%.